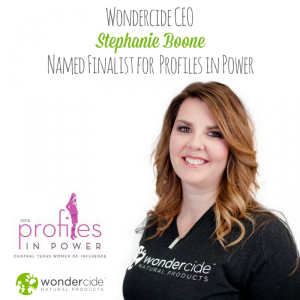 Wondercide founder and CEO, Stephanie Boone, is honored to be named a finalist for the Austin Business Journal’s 2016 Profiles in Power award. The award recognizes women in Central Texas for their contributions to the next generation of female business leaders and their communities. In addition to her work formulating non-toxic alternatives to chemical pesticides used on pets, people and property, Boone gives back to her community in countless ways. As one of just two women on the board of ARMA (Austin Regional Manufacturers Association), she works toward the continued growth of Austin’s manufacturing industry through advocacy, workforce development, mentorship and networking initiatives. Additionally, she served as a judge for Philanthropitch 2016, wherein over $140,000 were donated to local non-profits. In the same fashion, Boone served as a judge for the Austin GSEA (Global Student Entrepreneurs Awards) Competition 2016, supporting young entrepreneurs in their business endeavors. She can be found giving back to the Austin community and beyond through volunteer partnerships with the Human Rights Campaign (HRC), Austin Pets Alive!, Austin Dog Alliance. Under Boone’s leadership, Wondercide is proud to offer discounted pricing to local animal shelter staff and volunteers, as well as non-profit rescues and shelters as a small token of thanks for their contributions to pets everywhere. Six winners of the 2016 Profiles in Power award will be announced on September 29, 2016. Wondercide CEO Stephanie is Pet Industry Woman of the Year Award Finalist! Hi Stephanie i just came across your website…, and I love when someone does something with natural elements and is great…, my problem is that I have some kind of bug in my body that pricks me and it kind of pops out of my body ever since i went to Uruguay, SA in February we had been in the emergency room twice but they said is scabies and we know that is not we dont have the simptoms, what we have is popping and pricks like boiling water in our bodies, I looked in the internet and it looks like a tiny very tiny flea and when i put the specs in a magnifier it looks like tiny tiny fleas……. That sounds like one scary situation! I hate that you’re having to go through that! 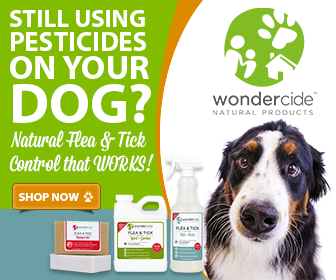 Several of our products, including our Indoor Pest Control spray as well as our Flea and Tick for Pets+Home spray will kill all sorts of bothersome pests by contact, and are safe enough for applying directly to the skin! You can use these sprays to treat mites (like scabies) or other pests that might be living on your skin, however it sounds like the pests you are dealing with might be sub-dermal; because our products are only meant to be used topically, and because we do not yet know the exact nature of the pest you are dealing with, it would be hard to say if our products would be able to completely eliminate this problem for you! Still, we wish you the best of luck in figuring this out – it certainly sounds like a troubling situation, and we hope you find a solution soon!